TACLOBAN CITY – ‘We are not going anywhere’ is the assertion of residents living along the coastlines affected by the ‘no-build zone’ policy being imposed by the Aquino government. Despite prodding from the state to abandon these coastal communities, the survivors resist and have in fact started rebuilding makeshift shelters from the debris left by typhoon Yolanda, making do with tattered tin roofs and defective structures. Urban poor leader Joel Abaño of the Kalipunan ng Damayang Mahihirap (KADAMAY), himself a survivor and resident of Barangay 37, Sabang, Reclamation Area in Tacloban City, said that his fellow survivors from the storm surge caused by typhoon Yolanda have nowhere else to go for shelter, employment and livelihood. The Sabang area, locally known as ‘Barangay Seawall,’ is one of the densely populated villages in the city. It faces the Tacloban sea port and lies adjacent to the central city marketplace. Most residents get their meager incomes from fishing, vending fruits, vegetables or fish at the nearby market or stevedoring at the port area. “Life has become more difficult for the survivors since the government has been very slow in delivering the immediate needs of the typhoon victims for food, shelter and livelihood. We know that the presence of Aquino’s minions – DILG Sec. Mhar Roxas, DND Sec. Voltaire Gazmin and DOE Sec. Jericho Petilla – in the region was a mere show, done in the guise of helping the victims rebuild their lives, but actually intended to position themselves in the 2016 elections,” said Abaño. Abaño lambasted the Aquino government for its anti-people rehabilitation program that causes the typhoon victims sufferings worse than Yolanda’s onslaught. The ‘no-build zone’ policy covering 40 meters from the shoreline prohibits typhoon victims from returning to their homes and livelihood. “It means massive displacements of families from their livelihood and denial of their right to housing,” added Abaño. The Reconstruction Assistance on Yolanda (RAY), a document released by the National Economic Development Authority (NEDA), seeks to streamline the strict implementation of the no-build zone policy. “The Aquino administration’s so-called concern for the safety of the residents living along the coastal communities directly runs counter to his economic policy of allowing large foreign mining corporations to encroach into Philippine territories, trample on our sovereignty, plunder the nation’s wealth and cause unprecedented damage to people’s lives and the environment,” said Abaño. “The most recent landslide in Southern Mindanao over the weekend that once again claimed lives is testament to the anti-people, pro-profit policy of the government. Our fellow poor families still endure the destructive consequences of the mining operations in the area,” added Abaño. Kadamay said that at least ten thousand families in Tacloban City will be displaced by the off-limits policy. The Aquino government intends to relocate them to the overpriced and corruption-riddled “bunkhouses” where families will be cramped into rooms measuring 8.64 square meters each. The space is too small for a regular Filipino family of five to ten members, lacks ventilation, and prone to fires. The occupants will definitely endure conditions way below human standards. “We need a rehabilitation program that sincerely addresses the welfare of the ‘Yolanda’ victims. The rehabilitation and reconstruction efforts of the government should not be geared towards profits for private entities. The no-build zone policy is land grabbing in a grand scale. The no-build zone policy is outright demolition. The no-build zone policy clearly serves big businesses, not the people,” ended Abaño. CAMP KANGLEON, Palo, Leyte – The top official of Police Regional Office 8 (PRO8) has directed policemen assigned in areas affected by super typhoon “Yolanda” to intensify their security preparation as students and school officials troops to various public and private schools for the resumption of classes on Monday. Acting police regional director Police Chief Supt. Henry P. Losañes has directed an intensified implementation of the Police Integrated Patrol System (PIPS) near school premises in Tacloban City and other areas in Leyte, Samar and Eastern Samar that were affected by the storm. “We assure the safety of school officials and students in these areas and will ensure police presence to prevent the occurrence of any crime incident,” he said. The police official informed that Police Assistance Desks (PADs) will be established in different schools and uniformed policemen will conduct mobile and foot patrol along traffic routes and within the immediate vicinity of school premises. He also advised the public, especially parents and students, to remain vigilant and observe precautionary measures to avoid being victims of petty crimes. “The public should report any suspicious looking person or actions noticed in schools and its immediate premises to the nearest police assistance desk or station for our immediate action,” Losañes added. PASAY CITY – Senate Majority Leader Alan Peter “Companero” S. Cayetano said that the national government is not helpless in protecting the Filipino public from the looming power rate hike brought about by the temporary shutdown of the Malampaya gas project. “Maraming iba’t ibang solusyon… But the government has to be willing to give, not only to take..." Cayetano said. Cayetano has been asking the government to look for “creative solutions” to cushion the effects of the power rate hike, saying that the Filipino public cannot bear the burden of the rising prices of commodities. Cayetano earlier proposed that a “floating” VAT rate be implemented to cushion the effects of the power rate increase, explaining that the government can reduce the VAT rate on power to 6% or 9% whenever the power rates are high, and correspondingly restore it to 12% when rates are low. “Sa tao, ang mawawala, 12%. Pero sa gobyerno, hindi 12% ang mawawala kasi sinisingil naman nila ang input-output ng VAT," he said. "Sa sinasabi ni Commissioner Henares, halimbawa, na mawawala ang P5B sa gobyerno kapag binaba natin ang VAT, but if prices increase by 5%, you lose P5B anyway, so bakit natin papahirapan pa ang mga tao para lang di maapektuhan ang revenue ng gobyerno kung yun din ang magiging resulta sa dulo. So wouldn’t we rather prevent an increase in electricity, petroleum, transportation, and other basic necessities now so that prices next year would not go up?” Cayetano said during the hearing. Aside from implementing a floating VAT rate, Cayetano also proposed that the government suspends the collection of the taxes on natural gas for three months. “The Congress can work on removing the tax on natural gas, which stands at P1.46/kWh. Kung tatlong buwan nating hindi sisingilin ang tax para dito, makakatipid tayo ng halos P4.50/kWh. Mas malaki na iyan sa P4.15/kWh na itinaas ng kuryente ng Meralco. Ang mangyayari sana, walang itataas ang kuryente,” Cayetano explained. In fact, Cayetano said that the government is poised to collect some 70 centavos in Value-Added Tax (VAT) out of the P4.15 per kwh increase in electricity rates that Meralco has earlier requested. “We discovered today na hindi lang ang mataas na tax ang nakakadagdag. Dito lang sa P4.15 [na increase per kwh], almost P0.70 ay sa gobyerno din pala mapupunta,” the senator said during the hearing of the Senate Committee on Energy on the power rate increase. “Itong gobyerno, sinasabi, pasensya na dahil pribadong sektor iyan, anong magagawa nila, may ERC. Iyun pala ay kumakabig din ito ng P0.70.” he noted. Meralco announced a P4.15-increase per kwh rate increase in the next three months, citing as justification the shutdown of the Malampaya gas facility and other power plants, which provide 40% of the electricity needs of Luzon. CATBALOGAN CITY, Samar – Troops of the 87th Infantry Battalion (87IB) tasked to conduct pursuit operations encountered a band of NPA rebels at Brgy Sto Niño, Motiong, Samar on December 14, 2013 and recovered one (1) Armalite rifle. Based on the report of 87IB, their troops were tracking the NPAs at Brgy Bay-ang, San Jorge, Samar last December 13, 2013 when they received a report from a concerned civilian that the NPAs were hiding at Barangay Sto. Niño, six (6) kilometers away. This is the same NPA group that the army encountered at Brgy Bay-ang, where one NPA was killed and the army recovered one (1) caliber 45 pistol. The troops immediately proceeded to Brgy Sto Niño and were engaged by the insurgents when they got near the location. A five (5) minute firefight ensued until the NPAs withdrew, leaving behind one (1) Armalite rifle and traces of blood indicating casualties on their side. There was no casualty on the part of the government soldiers. On the same day, two NPAs surrendered with firearms on two separate occasions. At around 2:00AM, Roberto F. Abunaler aka “Edgar”, NPA member operating in Eastern Samar surrendered to 14th Infantry Battalion bringing along with him one (1) Garand Rifle. Likewise, at around 9:00PM, Jeffrey Pajarito Delfin, aka “Jason/Hapon”, NPA member operating in Samar voluntarily surrendered to 20th Infantry Battalion bringing along his caliber 357. QUEZON CITY – The Department of Environment and Natural Resources (DENR) bared today the grand winners of the 2013 National Search for Eco-friendly Schools. A total of nine schools from the elementary, high school and college categories has recognized during the national awarding ceremony held at SM City North EDSA as part of the celebration of the National Environmental Awareness Month this November. Expected to personally handover the plaques and cash prizes are DENR Undersecretary Analiza Rebuelta-Teh, Congressman Mariano Piamonte, Jr. of A-Teacher Party List and private sector partners. DENR Secretary Paje recognizes the efforts all the schools that joined this year’s national search. “We are overwhelmed with the positive response of the schools whenever we conduct this search. There is so much pride and passion in implementing their eco-friendly programs. It is really inspiring to see how the school officials and their students work together to achieve a cleaner and healthier environment,” Paje said. For the elementary school category, the winners are Dubinan Elementary School in Santiago City for first place; Koronadal Central Elementary School II in South Cotabato for second place; and Kibawe Central School in Bukidon for third place. For the high school category, Ateneo de Davao University – High School in Davao City won first place; Doña Remedios Trinidad High School in Bulacan won second place; and Diadi National High School in Nueva Vizcaya won third place. For the college category, winners are Visayas State University in Baybay City, Leyte in first place; Miriam College in second place; and Ateneo de Manila University in third place. For the national level, prizes include, College, High School and Elementary: P50,000 – first prize; P40,000 – second prize; P30,000 – third prize and plaques of recognition. For the regional level, a certificate of recognition and cash prize of P15,000 will be given to regional winners for each category. Aside from the national prizes, there is also a special category entitled “Nestle Water Leadership Award” aimed at recognizing and promoting the water management solutions and practices of schools. A prize of P20,000 will be given to each of the winners at the national level for college, high school and elementary school categories. A prize of P10,000 and certificate of recognition will be awarded to each of the regional winners of all categories. The national winners for the Nestle Water Leadership Award are the following: Kasibu Central School in Nueva Vizcaya for elementary school category; Sumuroy Agro-Industrial School in Northern Samar for high school category and Ateneo de Manila University for college category. Another special category entitled “Meralco Energy Leadership Award” aimed at recognizing and promoting the water management solutions and practices of schools. A prize of P20,000 will be given to each of the winners at the national level for college, high school and elementary school categories. A prize of P10,000 and certificate of recognition will be awarded to each of the regional winners of all categories. The national winners for the Meralco Energy Leadership Award are the following: Commonwealth Elementary School in Quezon City for elementary school category; Matin-ao National High School in Surigao Del Norte for high school category and Visayas State University for college category. Launched last 2009, the nationwide contest dubbed, “National Search for Sustainable and Eco-Friendly Schools,” was organized to highlight achievement of schools that are committed in implementing various environmental programs. Open to all elementary, high school and tertiary school levels, the activity aims to encourage schools and academic institutions to become more actively involved in environmental issues at a practical and local level. It also aims to develop skills and understanding among students, faculty and school administrators to initiate active responses and increase community awareness and involvement on environmental concerns. The National Search for Sustainable and Eco-Friendly Schools is a joint activity of the Department of Environment and Natural Resources through the Environmental Management Bureau (EMB), the Department of Education (DepEd), Commission on Higher Education (CHED) with the support of Nestle Philippines, Smart Communications, Inc. (Smart), One Meralco Foundation and Petron Foundation. PARIS – Never failing to impress, Jessica Minh Anh just announced Singapore’s latest landmark and award winning development, Gardens by the Bay’s Skyway, as the official venue of the highly anticipated J Spring Fashion Show on 5 March 2014. Jessica, one of the world’s youngest fashion entrepreneurs, is the first and only person to be given permission to use this exclusive Skyway for a catwalk. Embodying the finest new technology and the greatest creativity, the up-in-the-sky 128 metre long catwalk between giant tree-like structures is expected to further redefine modern fashion standards. 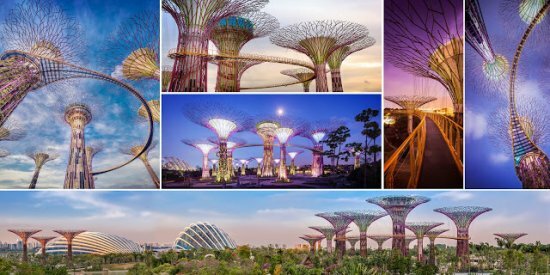 Gardens by the Bay is part of Singapore government’s vision to create a "City in a Garden” and position Asia’s superpower city as a leader in environmental sustainability and landscape architecture. The collaboration of J Spring Fashion Show’s catwalk, and the illuminating high tech skyway overlooking Singapore’s famous skyline, is the central attraction. The picture perfect venue matches Jessica Minh Anh’s concept of combining Mother Nature’s creation and man kind’s innovation in the digital age. The outdoor masterpiece will present an exquisite combination of Haute Couture and Ready-To-Wear collections from 4 continents. Jessica Minh Anh said “You will see a perfect balance between clean cut silhouettes and decorative details with multiple layers, strong colours and transparent pieces”. Jessica have previously worked with designers such as British fashion leader Paul Costelloe, Japanese power house Yumi Katsura, Dutch celebrity designer Addy van den Krommnacker, Lebanese Haute Couture designer Ziad Nakad, Portuguese bridal house Joana Montez & Patricia de Melo, and Taiwanese sensation Shiatzy Chen among many others. She added “There will be some surprises too!” Jessica’s previous productions have incorporated a cake dress and a dove as part of the show. This is not the first time Jessica Minh Anh turned an iconic venue into a phenomenal catwalk. The young director of J Model Management has continuously reached new heights at the incredible speed of 3 shows per year in different continents. Her recent achievements include the world’s highest fashion show on the Grand Canyon Skywalk in the US last month, the first ever catwalk on London’s Tower Bridge and PETRONAS Twin Towers’ Skybridge in Kuala Lumpur, the 90 metre floating catwalk on the Seine River in Paris, and the world’s first sundeck catwalk on Costa Atlantica in Dubai. And now with her ambitious event in Singapore’s Gardens by the Bay, there is definitely no sign of her slowing down. CATBALOGAN CITY, Samar – Troops under 87th Infantry Battalion encountered 10 NPA rebels operating in Samar on December 13, 2013 at Brgy Bay-ang, San Jorge, Samar that led to the death of one (1) rebel and recovery of one (1) firearm. According to the report of Lt Col Antonio B Dulnuan Jr, Commanding officer of 87IB, his troops were on routine security patrol when they received a report from folks living in adjacent barangay of Bay-ang that NPAs were seen at said barangay. When troops patrolled the areas near Brgy Bay-ang, they were fired upon by rebels which triggered a 10 minute firefight. The encounter resulted to the death of one (1) unidentified rebel and the recovery of one (1) .45 caliber pistol. Prior to the encounter, 87IB had received numerous complaints from the residents of Brgy. Bay-ang and its adjacent barangays that rebels were extorting food and money from the civilians and threatening those that do not give in to their demands. “We have been receiving complaints from folks living in Brgy Bay-ang and its adjacent barangays that the NPAs were extorting money and foods intended for their families’ expenses and consumption,” said Dulnuan. QUEZON CITY – Peace consultant Eduardo Sarmiento was sentenced to 20 to 40 years imprisonment by Judge Myra Bayot Quiambo of the Muntinlupa Regional Trial Court (RTC) Branch 203, yesterday, December 11, on the basis of trumped up criminal charge of illegal possession of firearms and explosives. “Sarmiento’s arrest, detention and subsequent conviction demonstrate the BS Aquino’s outright disregard of the peace negotiations. It shows how the government resort to criminalization of political acts to justify attacks on human rights against those it perceives as its enemy. It highlights the government’s bias against those who uphold the people’s rights and those who plunder the nation’s coffers like Napoles and those who perpetrate rights violations like Gloria Arroyo, and generals Eduardo Ano and Lacson,” said Karapatan secretary general Cristina Palabay. “Sarmiento should have been released as early as 2011, had the Aquino government fulfilled its commitment, contained in the February 2011 Oslo GPH-NDFP Joint Statement, to release ‘most, if not all, political prisoners’. In fact, Sarmiento should have not been arrested at all,” added Palabay. As a consultant to the peace process, he is covered by the Joint Agreement on Safety and Immunity Guarantees (JASIG) between the GPH and the NDFP, an agreement signed in 1995. Sarmiento has been involved in the peace negotiations between the government and the NDFP since 1986, representing the Eastern Visayas region. “Also, Sarmiento’s arrest on February 24, 2009 was faulty because it was warrantless and it is not unusual for the State forces to plant “evidence” to justify arrest. It has always been their SOP, victimizing not just activists,” said Palabay. Sarmiento’s arresting officers claimed they had with them two warrants of arrest for arson and for multiple murder and multiple frustrated murder issued by the Catbalogan Regional Trial Court Branch 29 and of the Municipal Trial Court of Paranas, Samar, respectively. Sarmiento was later charged with illegal possession of firearms and explosives for allegedly carrying a brown bag with one fragmentation grenade. Sarmiento had a P2 million bounty on his head which was supposedly awarded to an informant. At the time of his arrest, Sarmiento was in Manila for consultations. He was abducted near a mall in Alabang, Muntinlupa by joint elements of from the army intelligence and the PNP-Criminal Investigation and Detection Group (CIDG). He was tortured and held incommunicado for a week before the AFP announced his arrest. Sarmiento has been detained for four years at the PNP Custodial Center at Camp Crame in Quezon City. He may be transferred to the National Bilibid Prison in Muntinlupa. His legal counsels are due to appeal his case before the RTC. “The Aquino government is showing signs that it can no longer defend its acts before the people. The refusal to go back to the negotiating table, the attacks against human rights and human rights defenders, the criminalization of political acts is an admission of desperation, ‘gawain ito ng mga nasusukol na.’ It’s time the BS Aquino government face his accountability to the people,” ended Palabay. PASAY CITY – Senator Chiz Escudero said the possibility of seeking a temporary restraining order (TRO) from the court is one of the options to prevent the Manila Electric Co. (Meralco) from charging its consumers P4.15 per kilowatt per hour (kWh) beginning this month, the utility giant’s biggest power rate increase. According to Escudero, his office is in the process of obtaining pertinent documents for review and may challenge in court Meralco’s power rate hikes, which will be implemented in three installments. The power company claimed that the increase would help it cope with the adjustment in generation charges spawned by the maintenance shutdown of the Malampaya facility and other power plants where it gets energy supply. The huge hike will cost an additional P830 to the monthly billing of consumers using an average of 200 kwh. “Meralco cannot justify its increase with the generation cost rationale. If they are too quick to impose a price hike, they must also this quick or quicker to refund the consumers and give us our rebates in the shortest period of time. It should bequid pro quo,” he said. Escudero also blasted the ERC for sleeping on the job and allowing an antiquated system to prevail, which is inherently biased against consumers. “The ERC has been using a cost-based formula in fixing rates when it should use a market-based formula. In the cost-based system, the only basis they have in pricing is the cost presented by the distribution facility applying for an increase. It does not factor in the general market, like that much-awaited rebate. ERC does not even factor in the multiplier effect it will have on the market,” Escudero pointed out. “We still have one week to conduct sessions and hearing. We just passed the national budget and that’s already eighty percent off our load for this session. I believe we still have time. I hope this increase will be short-lived and hopefully will be stopped via the intervention of courts,” Escudero said.